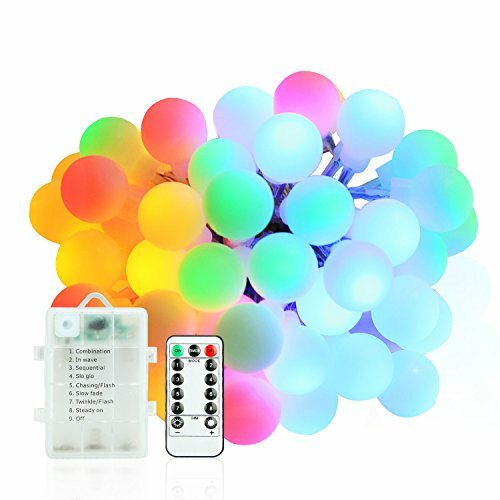 ♥Wireless Remote Control & 8 Light Modes You can simply press the button of remote control to turn ON/OFF the light, change lighting pattern(8 Modes), adjust brightness(Press DIM- / DIM+). It is very convenient for you to access all setting and options without getting out of door or bed. ♥BATTERY POWERED:Battery Powered: The lights should be powered by 3 AA batteries (not included), allowing the lights to be hung anywhere you need. ♥Application: You can use it for ambience decoration, like decorating your garden, yard, corridor, patio, party, holiday, festival, wedding, Christmas tree, etc. ♥Water Resistant: IP44 waterproof rating, which means the string lights are suitable for both indoor and outdoor decoration. ♥24-Hour Customer Support,We offer a free after-sales service for the twelve months after purchase.Please contact us if string lights have any questions ,we will replace or refund for you. Liked them so much I bought more!